Introduction to digital photography. If you're switching to digital from film or are just starting with photography in general, or maybe you have been shooting for some time depending on automatic settings and would like to gain more control over the process. You'll be introduced to all of the key technical concepts in an accessible, easy to digest manner to help you get the most out of your camera. 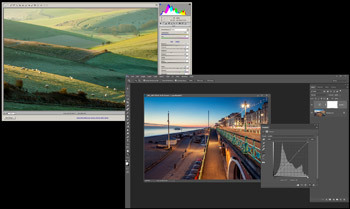 Image editing in Adobe Camera Raw/Lightroom and Photoshop. Learn the digital workflow, how to use essential RAW image developing tools and techniques: how to adjust white balance and tonality of your image, how to apply lens corrections, spot removal, noise reduction etc. Touchup work and advanced techniques in Photoshop, exposure blending, working with layers and layer masks, creating selections/masks. Hands-on practical knowledge. Lessons via sky are possible. Cost: £25 for 1 hour lesson or £100 for a course of 5 hours (to be spread over 2-3 sessions).